A common complaint among workers in factories, construction sites and several other fields is back pain. While back injuries affect more than 1 million workers, it costs the nation billions of dollars each year, according to the federal Bureau of Labor Statistics. Researchers at the Fraunhofer Institutes for Production Systems and Design Technology IPK and for Reliability and Microintegration IZM in Berlin have now developed ErgoJack – a soft-robotic wearable robotics system for the upper body. The smart soft orthosis relieves back strain and encourage workers to execute strenuous movements in a more ergonomic way, says a press release. The IPK orthosis uses motion analysis to distinguish between ergonomic and unergonomic movements. The miniaturized motion sensors are located on the shoulders, back and thighs. An intelligent real-time motion analysis captures ergonomic and non-ergonomic movements and delivers a vibration alarm in case of malposition or overload. 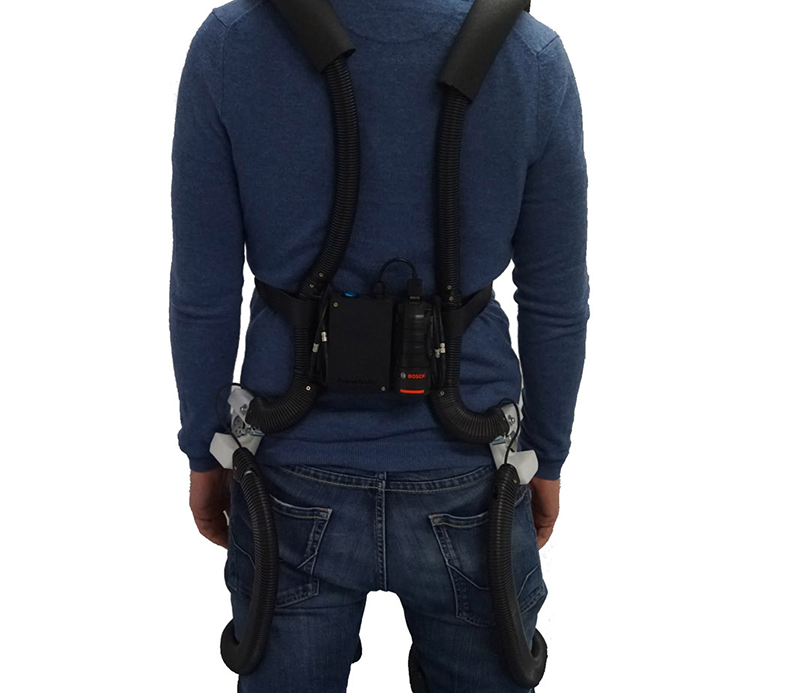 Inertial measurement units (IMU) built into the vest compare pre-learned movement patterns with the worker’s actual movement and assess it in real time. This takes just a few hundred milliseconds, says a press release. “Our soft robotic upper-body orthosis’ unique selling point is its real-time motion analysis. Specially developed algorithms based on machine learning and AI enable the ergonomics to be analyzed. This sets this orthosis apart from commercially available exoskeletons. The latter are wearable robots that, inherently to their functional principles, amplify all types of movements – even unergonomic ones – and merely divert the load placed on the wearer from an overloaded part of the body to a less taxed area,” says Dipl.-Ing. Henning Schmidt, a scientist at Fraunhofer IPK. The soft robotics vest also features robust, miniaturized electronics, including an embedded controller, a vibration module and a rechargeable battery. Fraunhofer IPK’s is to design the system layout, human-system-interface, mechanics, electronics and software including the machine learning/AI real-time algorithm. “The real-time algorithm requires complex calculations and has to be very robust, but a very small data set suffices to train the system to a new worker’s movement pattern,” says Schmidt. Next articleOculus Rift S vs. Oculus Quest: Which VR Headset Should You Buy?